A people as old as time itself, the Tohono O’odham (formerly called the Papago) have lived in what is now the State of Arizona in the U.S. and in what is now the State of Sonora in Mexico for centuries. A desert people, the Tohono O’odham have traditionally lived by hunting as well as planting corn, beans and squash despite the harsh desert environment they have always lived in. In 1853, the United States and Mexico drew the border that defines both countries today—without any consultation with the Tohono O’odham. What this has meant is that two-thirds of Tohono O’odham land is located in the United States and one-third in Mexico. One other major problem is that unlike the Native American peoples, whose lands are divided between the U.S. and Canada, the Tohon O’odham were never granted U.S. dual citizenship. Those Native Americans whose lands lie on the border between the United States and Canada were granted U.S. dual citizenship. Thus, these Native Americans can freely move between the United States and Canada. Still, for well over 100 years, the Tohono O’odham could freely move from Mexico to the United States and then back to Mexico. At the time there was no major border issue with the U.S. government in regards to what the Tohono O’odham did on their own land. This changed forever on September 11, 2001. Overnight security became the number one issue for the U.S. government and most Americans. Suddenly, the U.S. government began building barriers on the U.S.-Mexico border and right through Tohono O’odham land—again without consulting the Tohono O’odham. What this means is that those Tohono O’odham in Mexico cannot go on their own land to see their kin in the United States. Likewise, the Tohono O’odham cannot go into Mexico to see their families and relatives. The whole security issue has done what no border treaties and claim of sovereignty had done to the Tohono O’odham before……..really divide the people from themselves. This great tragedy is the result of the hysteria from the post 9/11 scare that pervades American politics today. 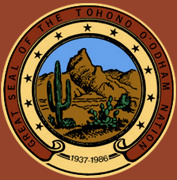 U.S. Border Patrol regularly go on to Tohono O’odham lands and prevent Tohono O’odham people in Mexico from crossing the border into the United States part of the Tohono O’odham nation. Likewise, U.S. Customs confiscate articles and products brought into the United States by Tohono O’odham from Mexico. The situation is to put it mildly intolerable for the Tohono O’odham. For some time, the U.S. Congress has tried to rectify the situation by granting Tohono O’odham U.S. dual citizenship so that it would be possible to set up infrastructure for these people to pass through their own lands uninhibited. Such legislation has never come up for a vote. This means that the Tohono O’odham must remain strangers within their own land. It is a continuing tragedy that has happened to these people without their agreement, and remains outside their control.